Holding patterns baffle most pilots. I see a lot of students holding up three fingers to the DG and mumbling nonsense to themselves. In order to end the confusion, use the Visi-Hold™, the easiest way to figure out your holding entry. Works with standard holds and non-standard holds (left turns). The Visi-Hold™ package comes complete with Visi-Hold template, directions, and two articles on holds: All About Holding and Holding Simplified. You'll pay no less than $14.95 (plus shipping!) for a complicated sliderule holding pattern calculator made by ASA. That's not even including shipping! Those of you who know what real IFR is like know that you can't fool around with a sliderule while the airplane is bouncing around. Instead, get the original Visi-Hold™, helping pilots to instantly know the holding pattern entry since 2000. Never wonder about holding entries again! Works with standard holds and non-standard holds (left turns). The Visi-Hold™ package comes complete with Visi-Hold™ template, directions, and two articles on holds: All About Holding and Holding Simplified. You'll pay no less than $14.95 for a complicated sliderule holding pattern calculator made by ASA. That's not even including shipping! Those of you who know what real IFR is like know that you can't fool around with a sliderule while the airplane is bouncing around. Instead, get the original Visi-Hold™, helping pilots know the holding pattern entry since 2000. Price: $10 (Free Shipping to US addresses). ISBN: 978-0-9823940-6-9 Sent First Class with Delivery Confirmation Tracking Number. After spending several weeks trying to get holds correct during my instrument training, I came across your internet ad for the Visi-Hold™. What a neat invention! When I received your package, I practiced with it a bit and then put it in with my IFR charts. On my next fight, I took the Visi-Hold out when my instructor called for a hold and hit that teardrop entry perfectly. Your Visi-Hold solved my problem quickly and efficiently for just $10. If I would of had this sooner, I would have saved hundreds of dollars. I took my instrument check ride last week and pulled out the Visi-Hold™ during the hold and placed it against the G1000 HSI. At that precise time, the examiner decided that was my distraction time. I was not distracted because the Visi-Hold™ laid out the proper teardrop entry. I did pass my instrument checkride. The Visi-Hold™ sure made me more relaxed. I believe that the Visi-Hold™ should be required equipment for anyone in instrument training. Save $18! Getting started and don't want to miss a thing? Coming up on a Checkride and need it all? Here's the package that everyone has been asking me to do for the last 10 years. It's the whole enchilada as they say on PBS. This package comes with SEVEN products: first you got the best selling IFR Checkride Reviewer which is #1 in the USA for IFR Check ride preparation. Built into the binding of the book is included Pilot's Radio Communications Guide and Learning IFR Enroute Charts as a chapters. Visi-Hold™ is absolutely included and you'll find that it's the easiest way to figure out holding entries (until you can do them in your head). 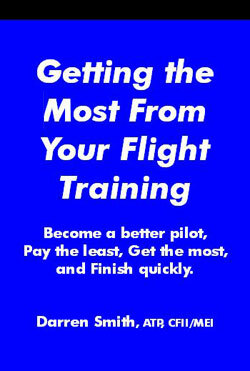 If that weren't enough, we add Getting the Most From Your Flight Training, the ultimate guide to getting the most, paying the least and becoming a safer pilot and the ultimate pilot's checklist, Pilot's Rules of Thumb™, which covers 30 normal and non-normal situations and has 9 special tools that you'll use on every flight. Icing on the cake, we include the publication Safer Approaches which includes a descent rate table I am sure you will keep in your kneeboard. We ship everything in a huge priority mail envelope with delivery confirmation tracking number - arrives in 2-3 days. Price: $50 - Always free shipping to US addresses. 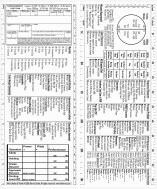 Special Offer: order this by 12/1/2011 and get a pad of IFR Clearance forms FREE, printed on 100% recycled paper. Supplies are limited, limit 1 per order, void where prohibited. Save $6. Got your IFR checkride coming up? Starting your instrument rating? Save $10 on the IFR Checkride Prep Combo - everything you'll need for your checkride. 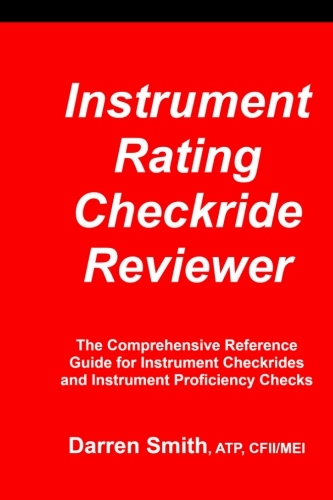 This package includes the best selling IFR Checkride Preparation guide, a 340-page review package is designed to help you to get through the Instrument Checkride. It also includes the Pilot's Radio Communications Guide as a chapter and Visi-Hold™ (described above). 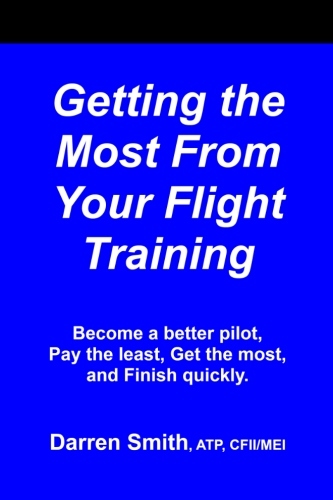 You'll also receive Getting the Most From Your Flight Training, the ultimate guide to getting the most, paying the least and becoming a safer pilot. 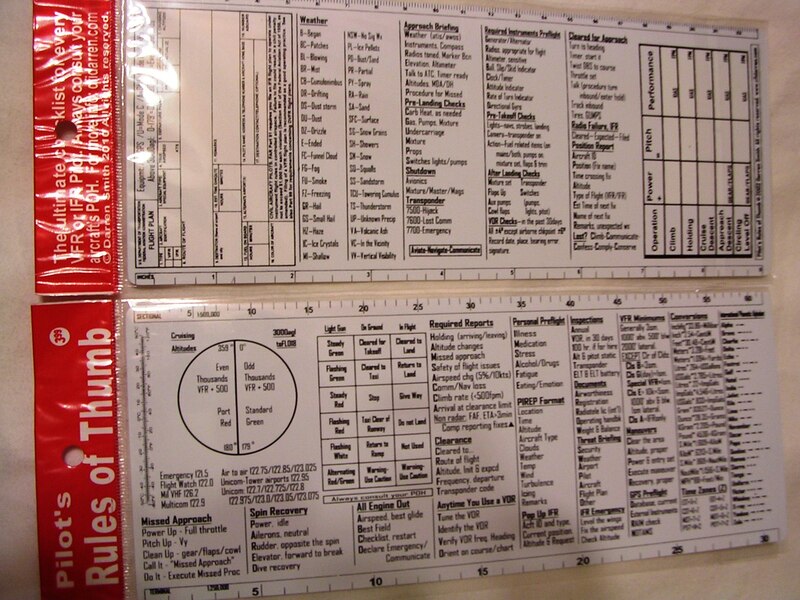 If that weren't enough, you'll also receive the ultimate pilot's checklist, Pilot's Rules of Thumb™, which covers 30 normal and non-normal situations and has 9 special tools that you'll use on every flight. Sent USPS Priority Mail with Delivery Confirmation Tracking Number - arrives in 2-3 days. Price $38 (Always free Shipping to US addresses). Special Offer: order this by 12/1/2011 and get a pad of IFR Clearance forms FREE, printed on 100% recycled paper. Supplies are limited, limit 1 per order, void where prohibited. Save $11. Get three top-rated pubs & the ultimate pilot's checklist: Learning IFR Enroute Charts & Visi-Hold™ & Safer Approaches & Pilot's Rules of Thumb™ (described above) home run combo package. Not only will you own the ultimate pilot's checklist, you'll master IFR chart symbology, you'll never wonder about holding entries again, and you'll perform the safest, most stabilized instrument approaches possible. This home run combo package is a perfect gift for the Instrument Rated PIlot. Sent US 1st class mail. Price $19.99 (Free Shipping to US addresses). Sent First Class with Delivery Confirmation Tracking Number. Need Help With Your Product ?